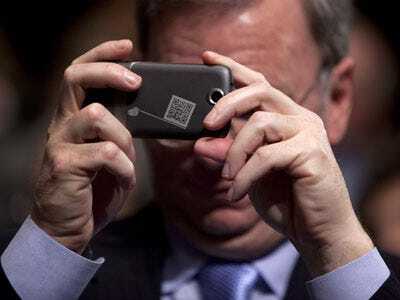 Lore has it than when Google's (GOOG) top Android developer first showed off the mobile operating system in 2007, CEO Eric Schmidt's first question was, "So what do I do when Steve Jobs kicks me off board?" Well, that finally happened over Summer 2009, and relations between the two companies and the two men have devolved since. Today, a reporter asked Eric what he thinks of Apple's new iPad. His answer: "You might want to tell me the difference between a large phone and a tablet." I personally agree. As I said in my previous post, this device isn't a real contender for geeks/professionals like my self. I can run Adobe products on netbooks as well as PC Tablets just fine so....WTF, Apple? One more thing, if I'm to hold this device like a tablet, (ie. clipboard, notepad,) then why didn't the put a button or even a scroll wheel on one of the sides? They brag in videos that "the user doesn't have to change to use this device." That leads me to believe that in holding this device, I would want to do what comes naturally, and for me, touching a button at the bottom doesn't seem natural to me. I see how the location is natural for a mobile phone or music player...but not a tablet. Well, I knew the inevitable iPad Jokes would occur soon after Apple's announcement but I had no idea that Mad TV had parodied Apple many years ago. 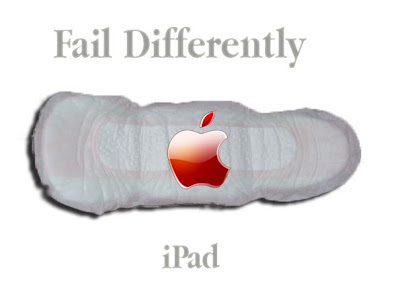 So, for your enjoyment, here's an iPad ad I created as well as the Mad TV parody.